A collaboration among faculty in the Eck Institute for Global Health and the Warren Family Research Center for Drug Discovery and Development is investigating new ways to kill the mosquitoes that carry the Zika virus, dengue fever, and other dangerous diseases. Mary Ann McDowell, an associate professor in the Department of Biological Sciences, and co-principal investigator Zain Syed, an assistant professor in the Department of Biological Sciences, recently received a two-year Department of Defense (DoD) grant for $418,000 to pursue compounds identified during McDowell’s previous large insecticide development project funded by the DoD. Both faculty are members of the Eck Institute for Global Health. Bruce Melancon, a research assistant professor in the Department of Chemistry and Biochemistry and the Warren Center, is collaborating in the work. Of the 80 diseases targeted by the US military, two-thirds are transmitted by arthropod vectors such as ticks and mosquitoes. The funded project, “Novel Insecticides: Structure Activity Relationships of a Formamidine Octopamine Receptor Agonist with mosquitocidal activity,” involves G-protein-coupled receptors, a large protein family that is already the target of some 40 percent of FDA-approved drugs for humans. The receptor that the group is targeting is the target for an already approved insecticide used for killing ticks on cattle. They are working with a chemical variation that kills mosquitoes, including mosquitoes that have evolved resistance to other insecticides. “The overall goal of this research is to develop control strategies to protect US civilians and military personnel deployed to less developed regions of the world where vector transmitted diseases are endemic; moreover, development of these methods will have broader implications for global health by providing approaches to eliminate world-wide morbidity and mortality due to these devastating diseases,” McDowell wrote in her report. Syed brings expertise in how organisms respond when they are exposed to chemicals, such as whether they are attracted or repelled. 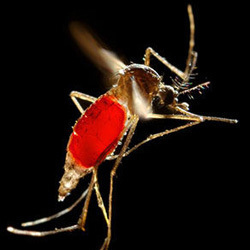 The target protein might be involved in how mosquitoes smell. Melancon brings expertise in medicinal chemistry and drug discovery and the Warren Center’s Notre Dame Chemical Compound Collection, some 20,000 compounds that can be screened to find the most promising candidates. Desired compounds are also made at the center, an advantage over McDowell’s earlier work when she had to order compounds internationally. Originally published by Gene Stowe at globalhealth.nd.edu on June 08, 2016.